Alan W P Thomson (editor), Ciarán Beggan, Ellen Clarke, Simon Flower, Brian Hamilton, Gemma Kelly, Sarah Reay, Tony Swan, Alan Thomson, Chris Turbitt (contributors). 2015. 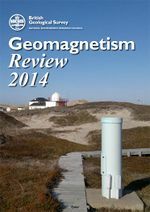 Geomagnetism review 2014. British Geological Survey Internal Report, OR/15/034. This page was last modified on 26 February 2016, at 15:46.